Can I Dip it in Ketchup? From when my children were infants, eating has NEVER been an issue. Hubby and I always joke that although they look Scandinavian, they eat like Italians – 15.5% anyway…but that is fodder for an entirely different post I am not yet ready to write – but I digress. As newborns, I breastfed both children until they were 12 months. I pumped and supplemented with formula, even when they began trying and eating solids. Now, as opinionated eaters, they have become more aware of what is on their plate. And while my daughter is more adventurous, Little Man is not (unless he can dip it in Ketchup). Case in point: Little Man has recently been requesting “sangwhiches” (it’s the Italian influence) shortly before his 8pm bedtime and just hours after eating dinner. Upon further review, I realized his dinner plate was not as balanced as the rest of the family and veggies were being avoided. In an effort to change this, I thought I would try what is this year’s quinoa – Spaghetti Squash. I learned, when cooked, it looks just like spaghetti. So at my last trip to the farmer’s market, I picked a two-pound squash. I sought the advice of a friend and chef on ways to prepare it and decided to give it a try. Baked 45 minutes in the oven and then serve after taking a fork to the pulp. 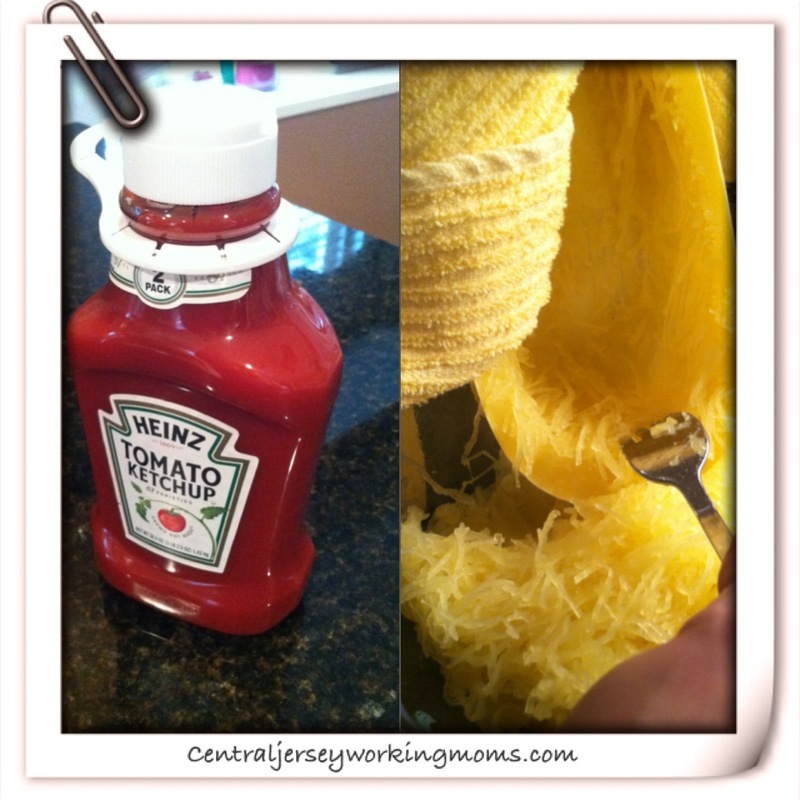 On the night I prepared the Spaghetti Squash, I was – of course – running late from work. With less than 45 minutes to prepare dinner which included baked chicken cutlets, I disregarded my wise friend’s advice (sorry, Cristin) and Googled “microwave spaghetti squash”. I came across a YouTube video that suggested six minutes per pound. JACKPOT! After puncturing the squash with a knife around the skin and microwaved for 12 minutes, the dish was ready. I removed the seeds, took a fork to the pulp and added a dash of butter and formaggio (Italian, remember). As we sat at dinner, Little Man looked at his plate with a suspicious eye. “Can I dip it in Ketchup?”, he asked. “Sure,” I said holding my breath. “It’s weird,” he replied as he cleaned his plate begrudgingly. DING! DING! DING! We have a winner. That evening, there was no “sangwhich” requests. Maybe next time I will try adding meatballs and my very own sugo…..
kids are so funny when it comes to food. My friend’s son basically eats only chees eon toast and fried chicken. Always a challenge trying to introduce new foods to (fussy) kids. I’ll tell her about your spaghetti squash! I would eat it…lol…. Let me know if he likes it!